Roaring Brook Press, 9781596436657, 48pp. Twitter feeds, school notes, advertisements, street signs--find poetry in the unlikely places with thirty comtemporary poets. Imagine picking up a scrap of paper off the floor or reading a sign at a gas station or looking at graffiti on the subway and finding poetry in these words. The literary equivalent of a collage, found poems take existing text, reorder and refashion it, and present it as a poem. Youthful, urban, and ironic, this energetic and surprising poetic form demonstrates the beauty of everyday words and will inspire young poets to find their own poetry. 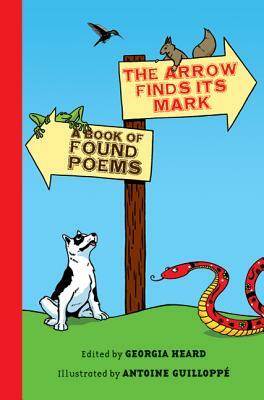 Find your own poems with Georgia Heard's The Arrow Finds Its Mark as your guide.